On 3rd February 2017 Peers debated the House of Lords Reform Bill, a private member’s bill from Green Party Peer Baroness Jones of Moulsecoomb. The Bishop of Norwich, Rt Revd Graham James, spoke in the debate. He set out why the central objectives of the Bill – to elect members of the Lords and create a new category of non-voting Peer – were flawed. 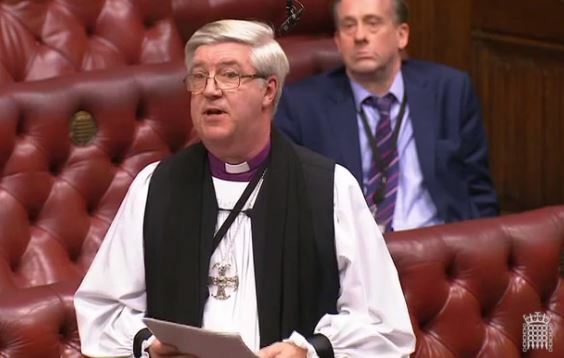 The Lord Bishop of Norwich: My Lords, I wondered whether to speak in this debate, but since the Bill makes specific reference to the Lords Spiritual, it seemed important to give a view from these Benches. I am grateful to the noble Baroness, Lady Jones, for recognising the continuing place for Bishops, even if an altered capacity—I will comment on Clause 12 in a little more detail later on. The question whether we should have an elected or appointed House was addressed in great detail by the ~Joint Select Committee in 2011-12 which considered the coalition Government’s abortive attempt at reform. Three points came out of that which are relevant here. The first is that an appointed House, for all its faults, knows its place. While a good deal of old-fashioned party politics brought the Clegg Bill down, progress was prevented, too, by the threat that it presented to the primacy of the House of Commons. I cannot help but wonder whether a second Chamber elected by a form of proportional representation on a regional list system may seem to some to have an even greater democratic mandate than a Commons elected by first past the post. Secondly, the culture and independence of your Lordships’ House would be bound to undergo radical change. As I read this Bill, I think that it is inevitable that the party Whips would become much more powerful, at a time when the public at large are much less wedded to political parties and even cynical about them. The presence of independent Cross-Benchers here at least means that Governments have to focus on winning arguments and not just votes. Turning the Cross Bench into a sort of party in itself seems to miss the point of the Cross Benches comprehensively. Lord Campbell-Savours (Lab): …The right reverend Prelate referred to the question of non-voting Peers. He might care to consider the fact that behind some votes there are no voices—ever. There are people who come into this House who have very good voting records but almost never speak. There are already two different categories of Member…. Lord Scriven (LD): …. No one here is talking about significantly changing the powers of this House in terms of being a reforming and revising Chamber. I agree with the right reverend Prelate the Bishop of Norwich that we will have to look at some powers within that but I am not of the view that this creates either a deadlock or a constitutional crisis, and examples around the world prove that to be the case…. Lord Young of Cookham (Con, Minister)...Another proposal was for two classes of Member. I have to say to the noble Baroness that that got the thumbs down during the debate. Almost everyone who took part voiced doubts about having voting and non-voting Members, including my noble friends Lord Norton and Lord Caithness, the noble Lord, Lord Beith, the right reverend Prelate and many others. Here I pay tribute to the work of the Bishops Bench in our proceedings. If I lived anywhere near Norwich, I would head for the cathedral every Sunday for a further glimpse of the evocative language that the right reverend Prelate uses to make his case. Baroness Jones of Moulsecoomb (Green)…The noble Lord, Lord Beith, said that non-voting would be a massive concession, and that is absolutely true. The noble Lord, Lord Campbell-Savours, referred to a “soft landing”, and I think that was my motive. It is a kindness to those who are here already and have contributed massively. We would keep them for as long as we possibly can. The right reverend Prelate the Bishop of Norwich pointed out that we must look at the powers, too, but that is not the point of this Bill. I agree with him and I think that in general we have it more or less right, but again, that is not the point of this Bill.